It might be something to do with living “up north”, but my brian brain starts to seize up at temperatures above 70°. I’m not using it a lot anyway, but when I do need it I like it to work. So we decided to have an early start and finish today, to avoid the torrid temperatures in the afternoon. Sunset at Cosgrove, 21:15 0n Sunday. 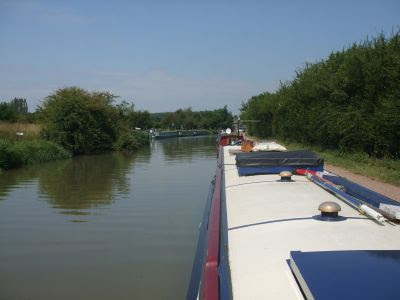 It was still quite warm when we pulled out, 5 minutes up to Cosgrove lock, then a visit to the services before cruising the 5 lock-free miles to Stoke Bruerne. At the top of the lock another branch leaves the main line, this one heading to Buckingham. At least it did, it now ends somewhat ignominiously after a couple of hundred yards in a pipe where Bridge 1 used to stand. 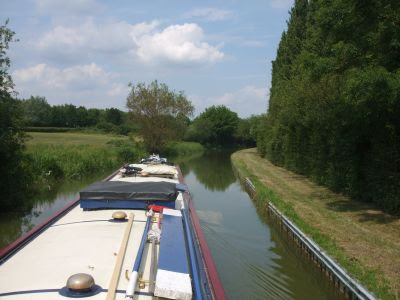 The first few yards are now used for mooring, the rest of the route is dry. 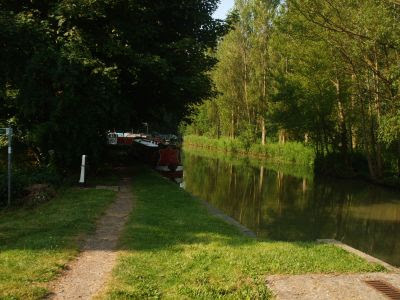 The canal ran 10½ miles to Buckingham, and was finished in 1801. As canals go it didn’t do too badly, still carrying cargoes, albeit haphazardly, into the 30’s. It was officially abandoned in 1964. The old towpath can be walked from Cosgrove to the A5, from this point on the canal bed is in private hands. 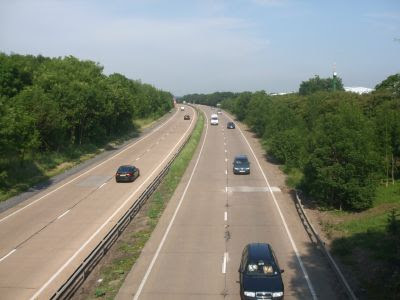 The A5 cuts the navigation off after about a mile. Just about where those repair patches are... I bet it's fighting back. There is active preservation society, website here. Back on the main line, and the canal leaves Cosgrove under the Gothic Solomon’s Bridge. Maybe not the best choice of construction material….. 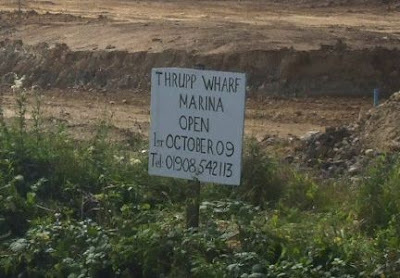 Yet another new marina is being constructed, this one near Thrupp Wharf. I think the opening date is a little optimistic, it’s little more than a hole in the ground at the moment. Yardley Wharf, near the village of Yardley Gobion (Yardley Goblin, according to Mags), is the home of Baxter’s Boat Fitting Services, and someone with a sense of humour. 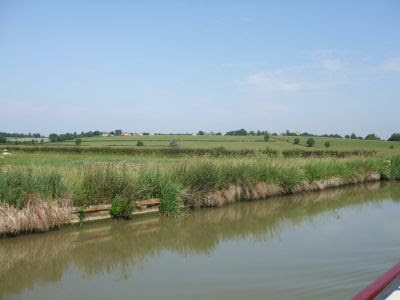 The canal runs through open country, not approaching any of the villages (they’re built on hills, probably for historical defensive reasons). Grafton Regis on it’s rise. 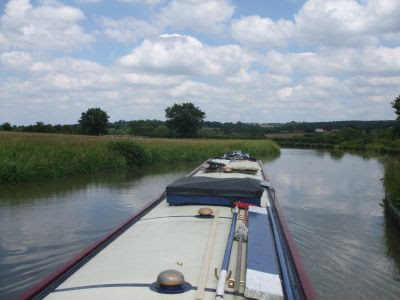 We arrived at the bottom of the Stoke Bruerne flight just before noon. We pulled in, disappointing the boat that had followed us from Cosgrove. “ Are you not going up the flight, then?” “No” said I, “I’ve had enough for today” They were hoping to be able to share the locks. 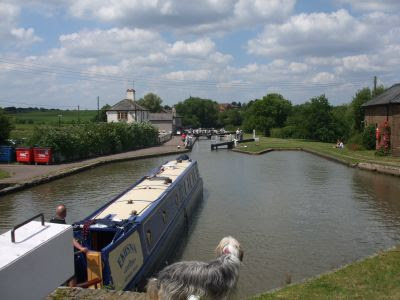 Moored at Stoke Bruerne bottom lock. This hot dry weather is all very well, but it’s causing problems for BW. The summit levels of the Rochdale, Huddersfield Narrow and Leeds and Liverpool canals all have passage restrictions in place. Roll on winter. A couple of epic trips, and a busy weekend. 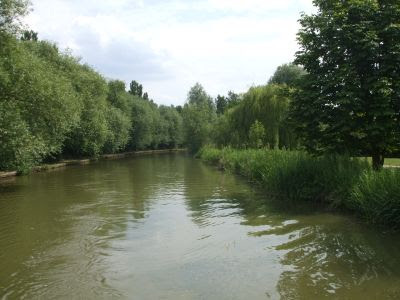 On Friday we moved on, just 3½ miles to the embankment over the River Great Ouse. 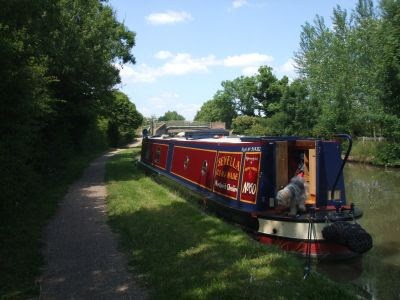 This is a good spot for the weekend, 14 day moorings, good towpath and lots of walks in the area. 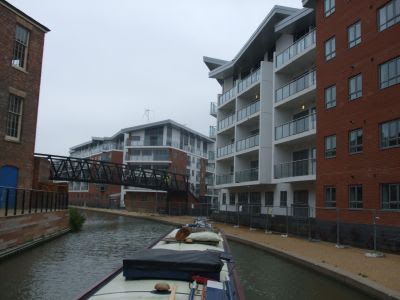 The canal crosses the River Great Ouse as it leaves the built up area behind. 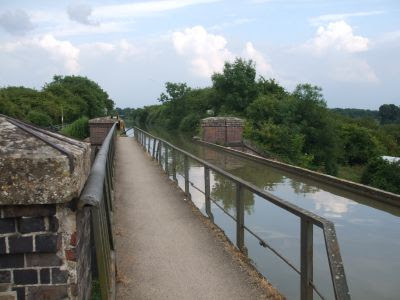 A ¾ mile long embankment has an aqueduct in the middle, carying the canal over the river. The span is a cast iron trough supported on stone pillars, and replaced the original brick structure. 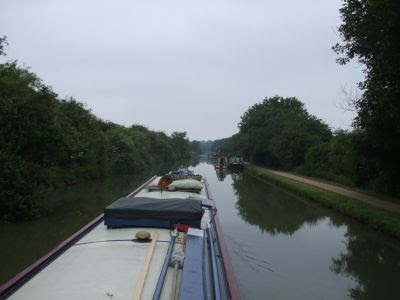 We moored a little further past the aqueduct, just as the first of several heavy showers struck. The first of the epic journeys…. I was out on my morning run on Friday, and overtook maybe half a dozen people, walking or slowly jogging. They were wearing running shoes and carrying light backpacks. It was on the way back, facing the oncoming walkers/joggers that I noticed they were wearing race numbers on their fronts. Curiosity thoroughly piqued, I stopped and walked alongside one chap, and asked him what was going on. They were on the Thames Ring Ultra-Marathon, non-stop from Goring on the river to Brentford, up the Grand Union to Braunston, back down to Oxford and onto the river again to Goring. 250 miles! They’re not allowed any support teams, and have checkpoints every marathon distance, 26 miles. Quite a few competitors had retired in the very warm weather, and some of the ones I saw looked pretty whacked. And they still had 100 miles to go. Made my run of 7 miles look a bit puny…. They started at 10 am on Wednesday the 24th, and the first guy home made it in just less than 60 hours. 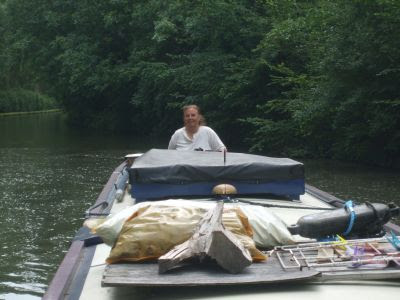 The second of the epic journeys….. We had a couple of very heavy downpours on Friday afternoon, but then the sky cleared, the sun came out and so did I, ready to make a start on the paintwork on the right side of the hull. 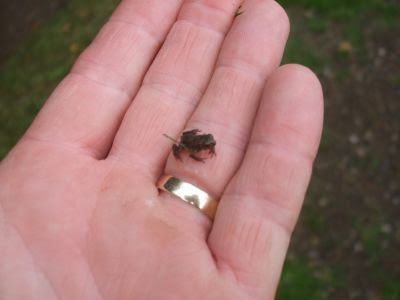 The towpath was alive with tiny frogs. Everywhere you looked there were these little creatures, appearing out of the undergrowth, crossing the towpath and plopping into the canal. One of hundreds, possibly thousands. They must have hatched in Broadwater, the fishing lake at the foot of the embankment, then waited for conditions to be right for the great migration. The showers dampened everything down nicely, so off they went, 50’ up the slope, and over to the canal and “pastures” new. At one point there was a row of froglets hanging on to the weed line of our hull. By later in the evening the rush had died down, and by yesterday morning there were only a few stragglers knocking about. I’ve not been anything like as energetic, but have done my fair share. With the weather being so kind, I’ve been able to prepare and repaint all the right hand hull side, as well as the counter cants and the stern bands. As well as slapping the paint on, Meg and I have been off exploring the area. There’re lots of walks about here, apart from the canal towpath. 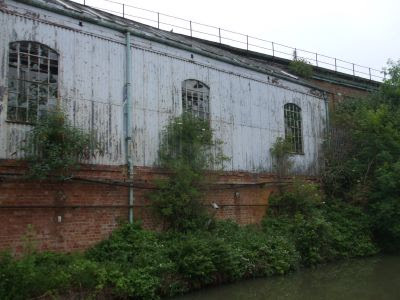 The area alongside the aqueduct and embankment hides an abandoned canal line, with 4 locks down to the river, and another 5 to bring it back up. This was constructed as an interim measure while the embankment was under construction. The lock in the picture isn’t one of the originals. 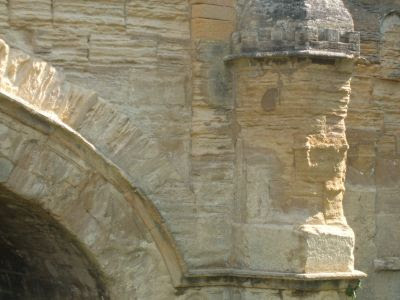 All structures and masonry which could be reused elsewhere were removed when the new aqueduct opened. 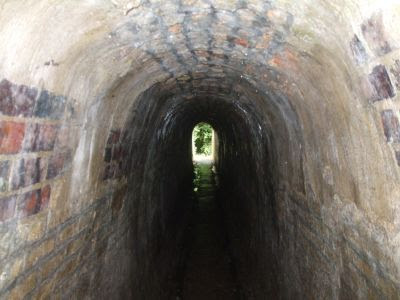 The original aqueduct was built of brick, but was a source of endless problems, finally giving way in February 1808 after just 3 years. 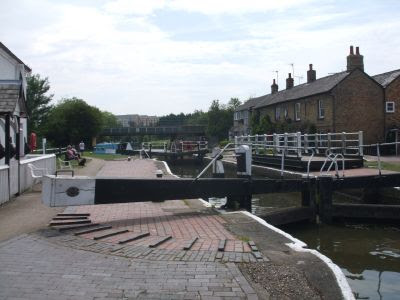 The locks had to be reinstated while the current structure was put in place, a task which took another 3 years. There are “cattle creeps” running through the embankment for livestock. 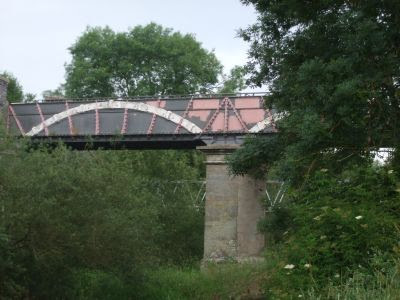 The design of the “new” aqueduct is based on that at Pontcysyllte, but with additional bracing to support the extra weight of the wide canal. 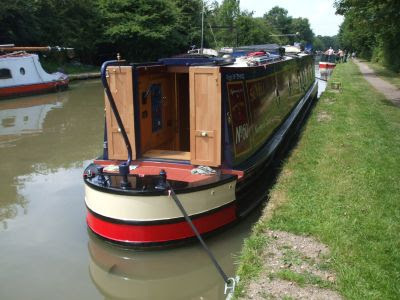 Unlike it’s Welsh big brother, two narrowboats can pass in the channel. 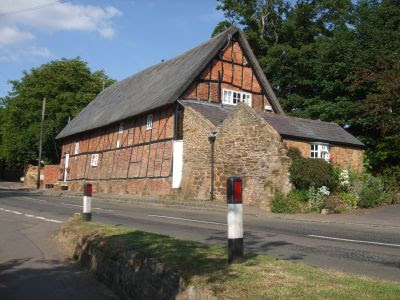 Another piece of local history is the village of Old Wolverton. This medieval village was abandoned when the local landowner switched from arable to grazing, a result of the 17c Enclosures. Wall lines and field boundaries are just visible in the field below the church. 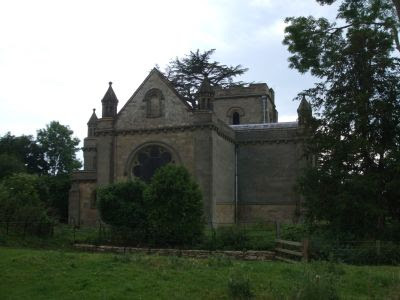 The Church of The Holy Trinity sits next to the remains of a Norman Motte and Bailey fortification. 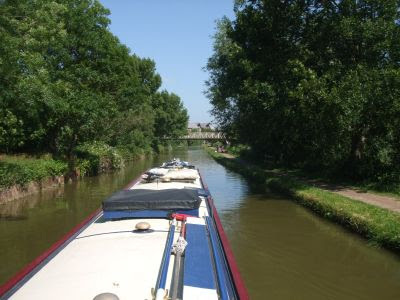 We’ll probably move on a bit tomorrow, up to Blisworth Tunnel. 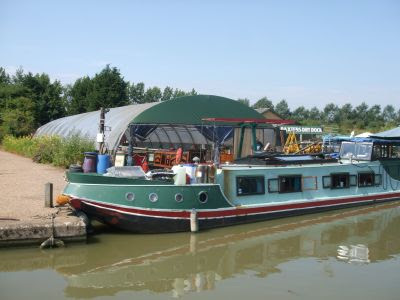 I want to have a look around the Waterways museum at Stoke Bruerne. 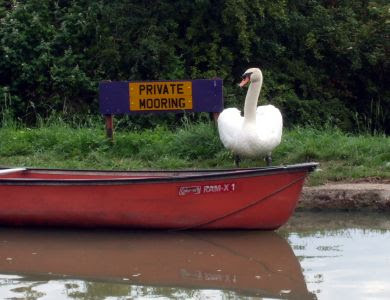 Finally, why does a swan need a canoe, and more to the point, his own mooring? I’ve not been looking forward to today. 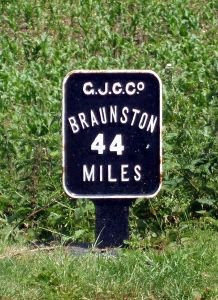 It’s a long 11½ miles on the map from the start of the built up area of Milton Keynes to the other end. But actually we were very surprised. There’s very little to intrude on the green corridor of the canal, just spots where the original villages, now absorbed into the whole, used the canal. The sections in between, although appearing urban on the map, are almost rural. The only indication that you’re running through the town is the occasional factory noise on the other side of the high hedgerow, and the new concrete bridges thrown across the navigation. But I’m getting ahead of myself. Off at 10:00 this fine bright morning, and we arrived at Stoke Hammond Lock about 15 minutes later. Another very picture postcard setting, with manicured lawns and colourful planting. I keep a record of hours run on the engine and the heating boiler, and reckon that we use about 1 litre an hour on each. My totals since the last fill, way back in Abingdon on the Thames, showed 155 hours, and the tank is, I believe, about 180 litres. Time for some of the red stuff! 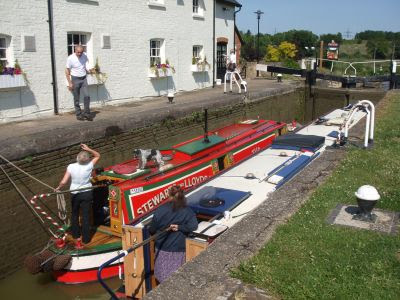 Sue on No Problem keeps a list of suppliers that allow self declaration of usage splits, and Willowbridge Marina, on the outskirts of Bletchley, is on it. So that was our priority. Arriving at the marina, we pulled onto the towpath on the opposite side, to watch something you don’t see every day. 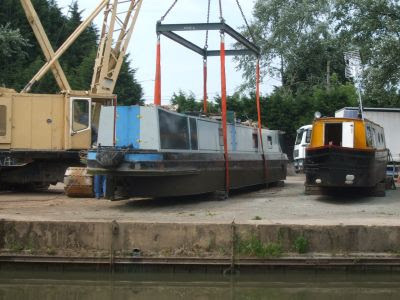 Narrowboat being craned out for hull blacking. Up she goes…. And safely on the bank. The operation and subsequent tank fill took around an hour, so it was getting on for lunchtime by the time we arrived at Fenny Stratford. The lock is a short distance on, and only drops the level by 13”. 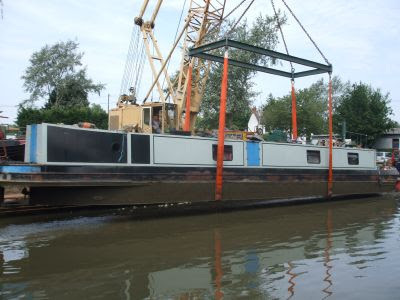 It’s also got a swing bridge across the chamber that has to be moved before using the lock. 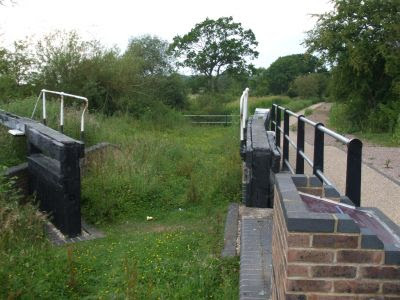 This is the last lock on the down slope from the Chilterns, and indeed the last for 11 miles. The next is at Cosgrove, and we’ll reverse the operation, going back uphill to Blisworth Hill before diving through the hill in Blisworth Tunnel. I was saying about cruising through Milton Keynes, and here is why. Wooded sections between the old villages. New concrete road bridges remind you of where you are. Even the ubiquitous housing developments are mainly set back from the canal, maintaining the green corridor. 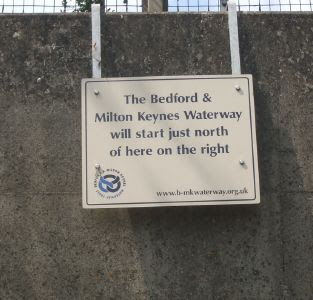 The new Bedford and Milton Keynes Waterway is planned to join the Grand Union just north of bridge 82A. This will enable broad beam boats to navigate to the Fens from the main network. 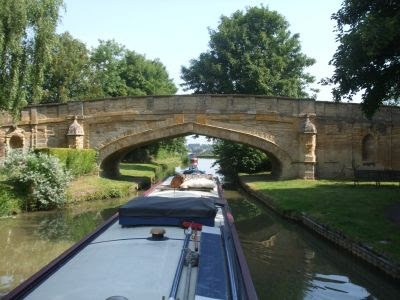 The only access at the moment is the Northampton Arm to the River Nene from Gayton, and the 17 locks here were built to narrow beam standard. We pulled over at the BW services at Giffard Park, so we’re in good shape now, everything filled and emptied as required. 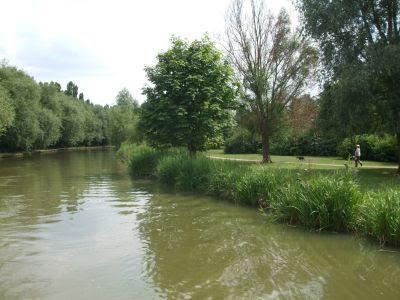 We pulled over about 1½ miles further on, near the Wildfowl Centre at Linford Lakes. It’s not as far as we’d liked, but it seems to have been a long day. 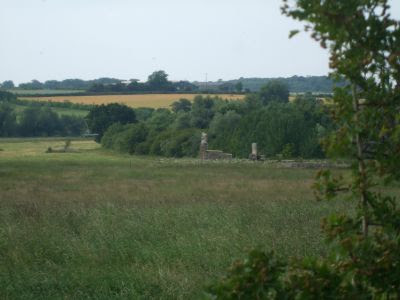 It’s a nice spot anyway, looking down towards the lakes and the ruined church at Little Stanton. Another thing you don’t see every day…. Mags on the tiller, taken by me in the bows! She’d sent me below to make a brew. 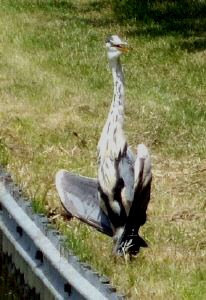 And a heron trying to cool down…. We were just coming in to moor when I saw a commotion in the water ahead. 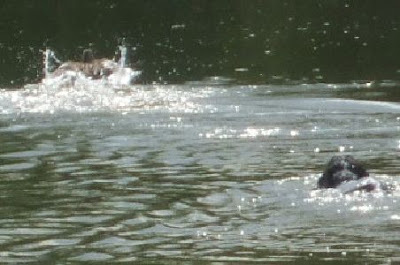 A spaniel was in the canal, chasing a mallard and her young family. She was clever enough to make enough noise to keep the dog’s interest, so the brood made good their escape. Then she took off, quaking loudly and returned to her offspring. 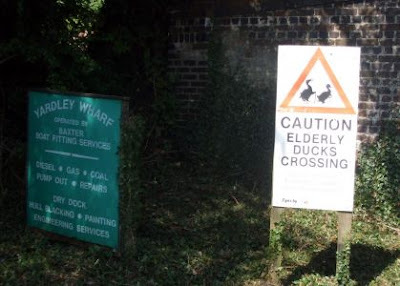 It sounded an awful lot like she was laughing… but ducks don’t have a sense of humour, do they? There would only be one winner, the one that can fly! The owner of the dog was screaming at it from the bank, but it was having far too much fun to take any notice. 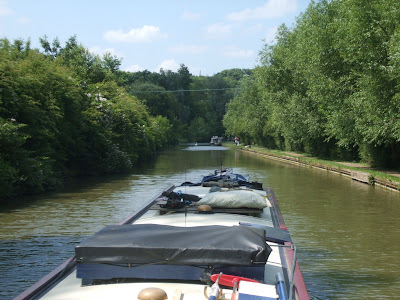 Yet another fine sunny day took us onwards towards Braunston. It was 94 miles away when we left the Thames, now it’s about 42. Not going very fast, are we! The canal is still very pleasant, and quite quiet too. 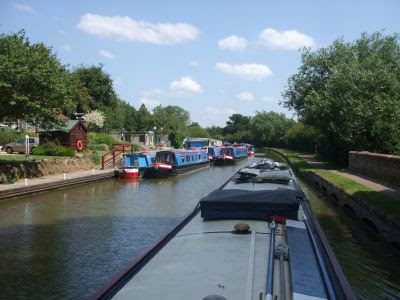 There are one or two hire boats about from the bases at Gayton and Leighton Buzzard, but there are a lot more still waiting for crews, at least at Wyvern Boat Services in Linslade. I was just getting ready to pull out when a boat came past, an ex BCN tug heading for the boat show at Braunston this weekend. 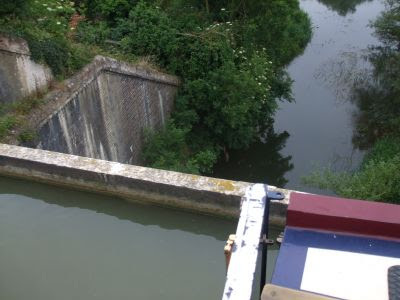 We caught them up at Church Lock, and shared this and the rest of today’s locks with them. 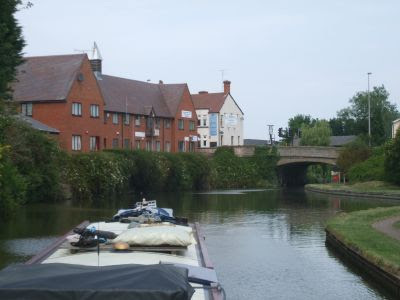 We both pulled in on the shopping moorings at Leighton Buzzard for a few bits and pieces, before setting off again to Leighton Lock. We were warned against stopping in Leighton Buzzard, apparently it has a poor reputation. 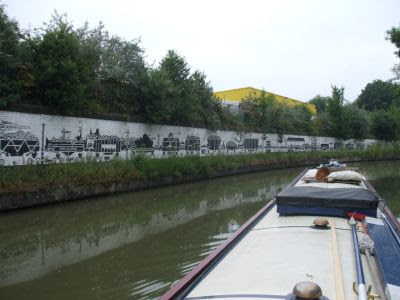 But the town looked fine to me, well kept gardens leading down to the canal edge, a good all weather surface on the towpath, and no more graffiti than you’d find anywhere. We wouldn’t have stopped here overnight anyway, even though there are good 14 day moorings. We much prefer to be out in the country. 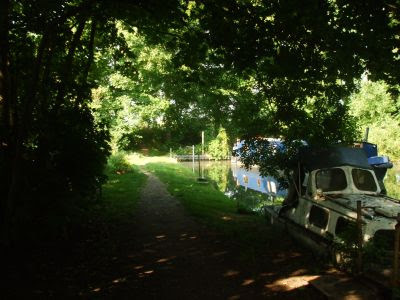 There’s an excellent stretch between Leighton Buzzard and Soulbury, about 2½ miles long starting in woods full of birdsong and opening out into fields as the canal follows the Ouzel valley. 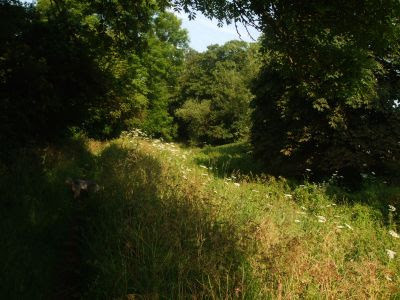 Wooded banks lead on to…. 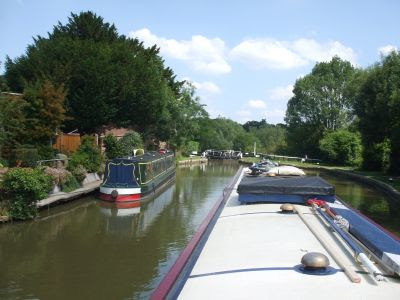 Soulbury 3 The lower 2 locks, gongoozlers and The Grand Union. 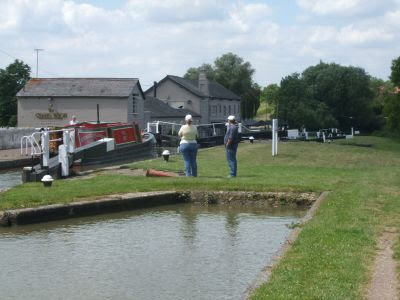 The short lead in the foreground was the entrance to the now filled in paired lock. We parted company with our lock companions here, they chugged off while we took it steady, looking for a likely mooring spot. 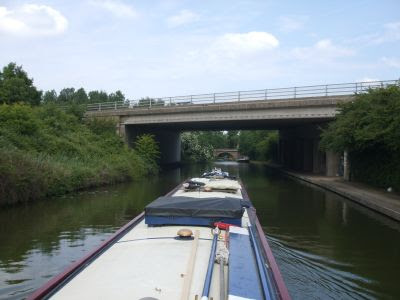 We finally pulled in just before Bridge 106, near Stoke Hammond. I took Meg for a long walk this evening, up the hill to the west to the village of Great Brickhill. 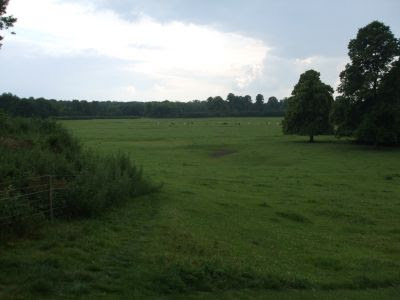 During the Civil War, Parliamentarian forces under the Earl of Essex were billeted here. I’m glad we’re not on the New Junction Canal in South Yorkshire this weekend. Much as I love anglers, I think 390 at one time would OTT…. Between Kirk Sandall and Sykehouse Lock Saturday 25 July 2009 - Saturday 25 July 2009 Angling Trust Division 3 Championships. Approx. 390 anglers will be taking part in the Angling Trust's Division 3 Championships along the New Junction Canal. Craft are advised to avoid the area if possible or slow down on approach where the competition is taking place. Marshalls will be on site to assist where applicable. I hadn’t realised, but last night we were moored within ½ a mile of the site of one of the most momentous events in modern criminal history. 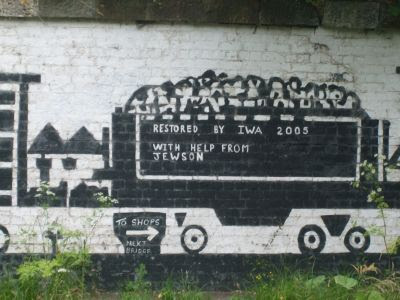 In 1963 The Great Train Robbery took place just across the fields to the west. Leatherslade Farm, where the gang holed up for a few days afterwards, is 18 miles away, towards Oxford. 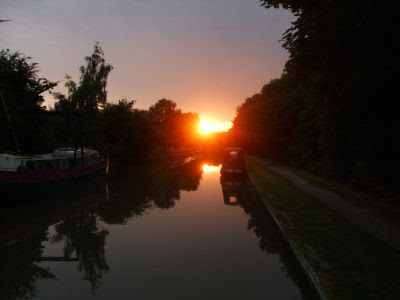 The longest day… and what a cracker! A damp sort of day.